Some often have a misconception that introverts are shy, reserved, or worse, a recluse. Thus, traveling might seem to be the last thing we would enjoy. Sure, the energy of the crowd drains us, and we only have short bursts of extraversion, but we don’t hate the world. Or at least not all of it. 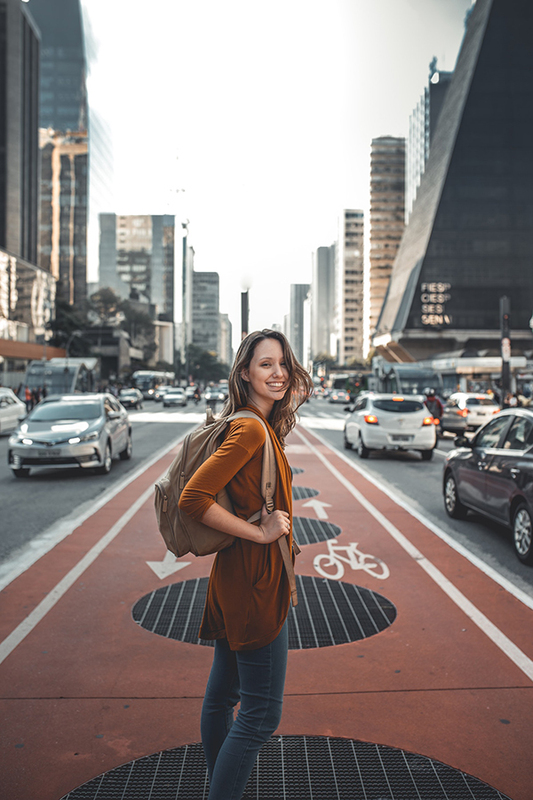 So, if you’re an introvert who wants to travel, or would be traveling with one, these are some travel tips for introverts, who want to make the most of their vacation. And by that, I mean to let your OCD tendencies out on a loose. Before booking a ticket or arranging for your travel accommodations, research about your destination. This isn’t to dampen the excitement of discovering a new place, but to prepare. Unlike our counterparts, we, introverts aren’t used to winging it. If we do, we might end up holing up in our hotel rooms when we drained our energy. Seek the help of friendly Google to search for travel articles about your destination. This will give you an idea of what to expect when you get there. You will also have additional inputs for your itinerary aside from the popular spots. 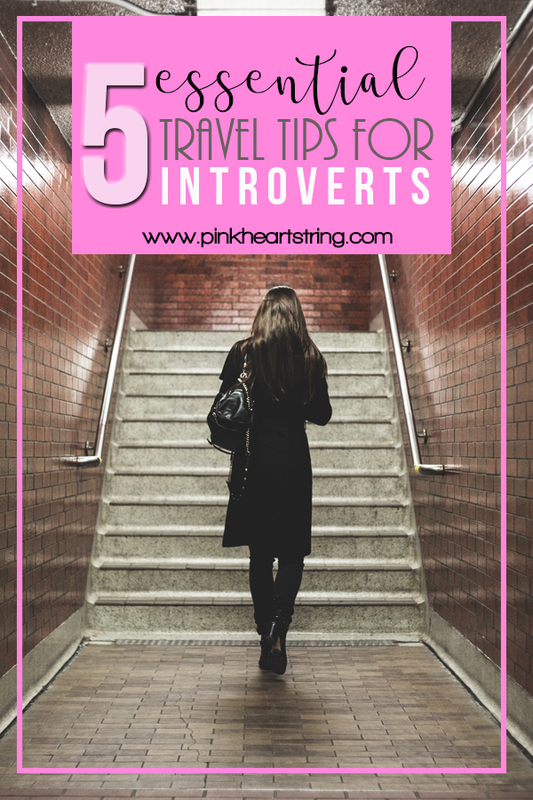 If you’re up for more, you can also try checking out an introvert travel blog. We’re observers and these blogs have insights other than common activities that tourists do. You might even learn about that little coffee shop or the quaint bookstore not many tourists know about. I am serious when I said that you should let your OCD tendency loose. Have a schedule of where to go and how long to stay there. It’ll help in conserving your energy throughout the day. And by that, I mean where, when or how long you would stay with a crowd. List the places you want to go to and their distance from each other. This will help in deciding where to stay. It will also give you a heads up whether you would use public transportation or hire a car when traveling around. If you have decided to try a travel tour for introverts, check the tour itinerary so that you can decide which activities to opt out from. Same thing if you would be traveling with a group or have a travel buddy. It is best to know what you would be going yourself into. In other words, how to get away without going home. Yet. You’ve picked out the places you want to go to and the hours they’re open. You’ve checked their distance from each other and your transportation options. You have even decided the order you will visit them. Planning on popping that champagne already? Not just yet. 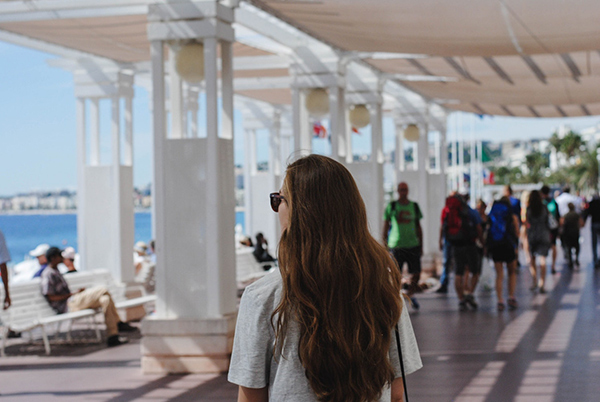 Most travel tips for introverts would include this one thing: alone time. Even though we enjoy the crowd now and then, we can’t stay around many people for too long. Introverts have a different tolerance for how big their group can be. Mine is five. A group more than that, I would feel my energy depleting faster. I enjoy hanging out with my friends and traveling with a bunch of them. That doesn’t mean that I’m okay with being with them 24/7 for an extended period. Instead of forcing yourself to join them but end up spoiling the fun, opt out. A couple of hours of alone time would do wonders in recharging yourself. You would be up to their antics again afterward. Instead of surfing the channels during your alone time, why not explore in your own terms. Go on a walking tour or a trip to the park. Hangout by the beach, perhaps. When planning your itinerary, check for walking tours around the area and experience the culture. If your hotel is near a museum, drop in to take in the history of the place. Unwind in nature by going to a park or beach. Alone time doesn’t mean getting away from civilization. Practice cautious and be alert to your surroundings. Go where there is substantial foot traffic and avoid shady places even when they offer a little adventure. Flying may be the easiest mode of transport but not the most comfortable for introverts. There’s the airport crowd, then the flight stewards who ask you about what you need. If only you could answer, “To be left alone, please.” Not to mention being unfortunately seated next to a chatty person. Personally, I prefer traveling by bus or train. I could use the hours to catch up on my reading or sleep. But if there’s no other way but to hop in a plane, taking either the first or last flight would be my choice. Less crowd in the airport and your seatmate would either be too sleepy or too tired to pay you attention. I wish for the day when looking for accommodation has a filter to opt out for socialization. Or at least when you want to. Or that they would release an introvert travel guide to know the recommended hotels for introverts. What are the introvert’s options for accommodation? Needless to say, backpacking is off the table for me. Hostels may be cheap but I cringe at the thought of communal bathroom and sharing a room with a stranger. Hotels can be pricey but give plenty of socialization options. You can either eat with the guests or order room service. If traveling with friends, you can either get a separate room or share it with just one. Airbnb places can be lonely when you’re traveling alone. Unless you would be renting out a room in an apartment or house. When with friends, you have the same option of getting your own room or sharing it with them. Bed and breakfast places are usually quaint and have a homey feel. There are fewer guests to mingle with as well. Be sure to check out reviews before making a reservation. 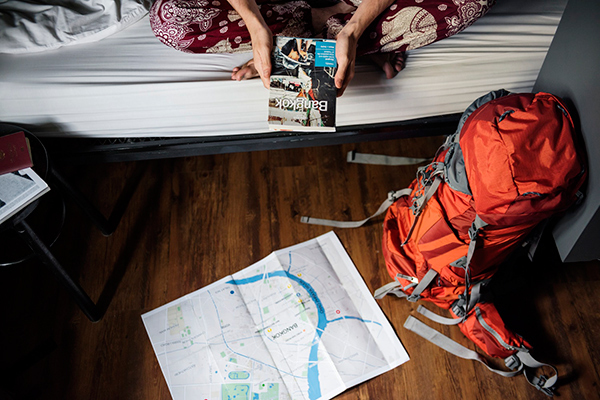 Whatever type of accommodation you decide on, pick one with a coffee shop or a bookstore nearby. You know, to get away once in a while. There are a number of travel checklists on the web for usual items to pack like clothing, passport, etc. This won’t be a complete list of travel tips for introverts if we don’t include these must-haves. When flying is inevitable, a good pair of noise-canceling earphones saves you from having to interact with the airport crowd. I don’t know about you but my people-watching hobby has gotten me some unwelcome conversation. Putting on a headphone helps me resist watching the people around me and someone mistaking that me staring means I want to talk to them. Traveling means being prepared for the possibility of delayed flights, missing the connecting bus or plane, or a longer trip than planned. Introverts usually don’t mind the wait. We even welcome the chance to whip out our book or an e-reader to while away the time. It has been my habit to pack a couple of books and an e-reader when traveling. If I chance upon a bookstore, I would be more than happy to grab one or two for the return flight. Sipping a cup of freshly-brewed coffee in an open-air cafe can bring anything from random thoughts to acute observation of the goings-on around an introvert. Or, at the end of the day, when the world is winding down, a reflection of everything that has happened comes rushing in. A journal, electronic or the traditional one, comes in handy for times like these. What is traveling without a good camera to take a piece of paradise you visited? It is not only to chronicle your adventure but also to document the captivating sceneries you’ve been to. And don’t forget a selfie stick, especially if you’re traveling alone. Introverts know very well how hard it is to come up to a stranger to ask to take their picture. Not to mention how awkward it is to smile for the unknown photographer. Many think that traveling wouldn’t entice an introvert because it involves being around people. The truth is, we can be around people but not in the crowd. We prefer observing over being part of the activities. And more often than not, we experience more being outside looking in than the other way around. Unless, of course, we want to willingly take part in something. If you’re an introvert or would be traveling with one, note these five essential travel tips for introverts before you pack up and go. And don’t forget to enjoy and make the most of your adventure. Katie is a perpetual daydreamer who takes a break from being a mother by weaving words. She is an accountant by profession and a former teacher. She decided to become a freelancer for her only son. 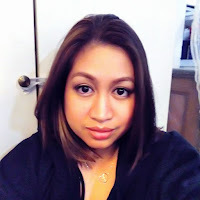 She shares her creative writing outputs at Randomly Creative.